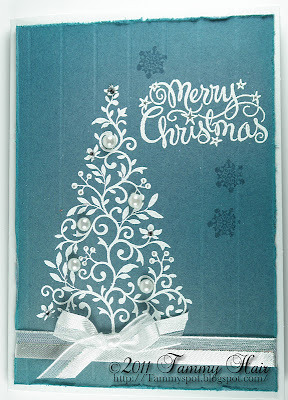 I love the stamp I used today and with a few watermarked snowflakes on the background, a touch of ribbon and a little bling, the result is classic! Interesting snowflake fact: According to the Guinness Book of World Records, in 1887 the largest snowflake fell in Fort Keogh, Montana measuring 15 inches wide and 8 inches thick! Can you imagine being out and about during that snowstorm? Don't know whether you would call them snowflakes Tammy? Gorgeous card Tammy, love the design of that tree. I think whoever measured that snow was a flake! Very stunning! Love the touch of pearls too. That stamp looks like it is extremely versatile. Classic and beautiful! Love the pearls on the tree and the wonderful color of blue. I love that tree...but how on earth could a snow flake be THAT big??? 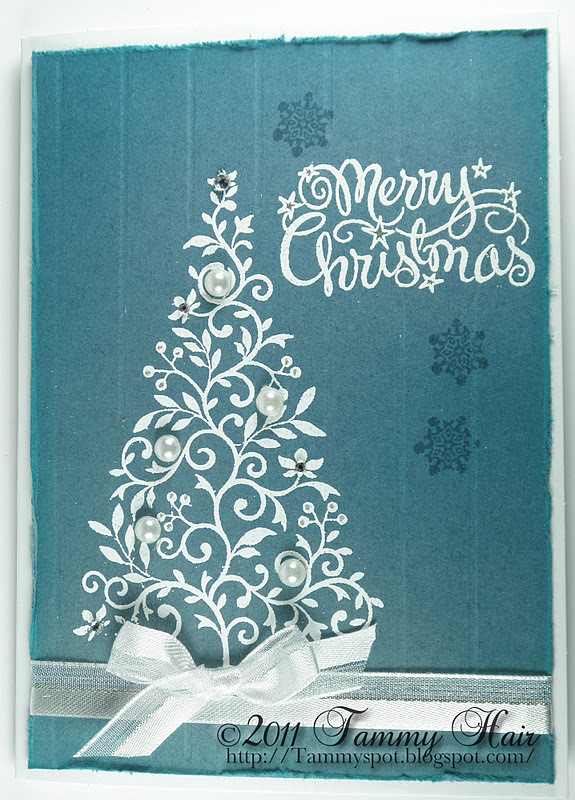 I love the crispness of the white embossing of this beautiful tree on the blue. So so elegant! Hi Tammy what a beautiful tree I love the swirls and how you have put the pearls on the branches,k that ribbon as well as the sentiment look super. THis is a clean and lovely card. beautiful creation!